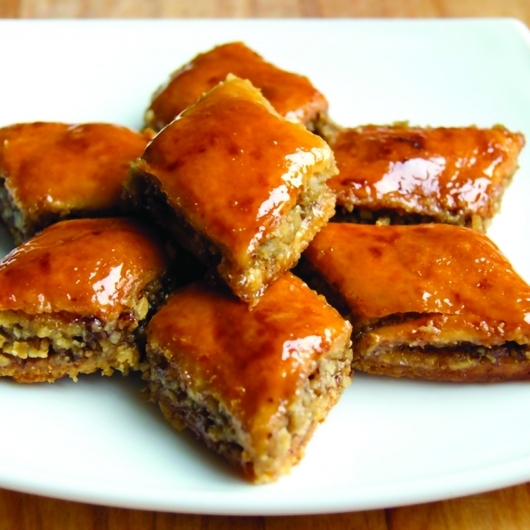 Pakhlava, also known as baklava is a rich, sweet pastry made of layers of filo (thin unleavened dough) filled with chopped nuts, sweetened and held together with syrup or honey. It is a staple of Turkish cuisine and is also found in Central and Southwest Asia. This sweet pastry is very popular in Georgia as well. Here we present the Georgian version of this delicious dessert. Sift the flour, add soda, melted butter, egg yolks and sour cream. Knead the dough and put it into the fridge for 20-30 minutes. While it is in the fridge, prepare the filling. Chop up the walnuts and prepare meringue with egg whites and sugar. Mix it with walnuts. Take the dough out of the fridge and split it into two parts. Flatten both parts, spread meringue with walnuts over one part and cover with the another. Connect the edges of two layers firmly and cut the resulting cake into squares. Glaze them over with egg yolks. Bake for 35 minutes at 190°C. Once it’s done, mix powdered sugar with cardamom and sprinkle it over the cakes.